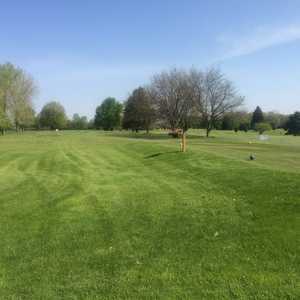 Grand Rapids, MI - Step onto the turf at The Golf Club at Thornapple Pointe in Grand Rapids, and you are bound to run into all breeds of high-powered professionals--doctors, lawyers, company execs--who have ducked out of the office to play hooky (i.e., golf). Of the several quality courses in the Grand Rapids area, Thornapple Pointe is perhaps the most centrally located and easily accessible. In fact, this wooded, watery track can be reached via just about any mode of transportation you can imagine, be it by plane, train, or automobile. For those players who demand quiet seclusion in their courses, however, the easy accessibility of Thornapple Pointe comes with a price. Specifically, the course's location next to the Gerald R. Ford International Airport results in dozens of up close and personal encounters throughout a round with the underbellies of aircraft. The railroad tracks running along several holes are heavily trafficked by freight trains. And I-96 is at certain points little farther than a Woodsian drive away. Oh, and on nice days the odd jetski may buzz past just as you are stroking that eagle putt. And, truth be told, the challenging and well-designed links here occupy land that would not be good for anything other than a golf course: No one would want to live or work in a flight path like this. 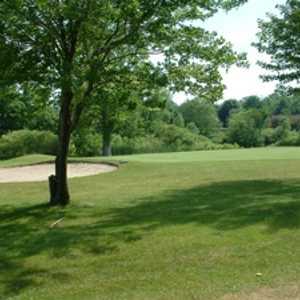 As a golf course, however, the land is well suited. At 6,821 yards from the tips, this par-72 Bill Newcomb layout has a nice balance of long par 4s (ranging from 387 to 453 yards) and short ones (320 to 368 yards). Likewise, the par 5s range from the reachable 487-yard 7th to the daunting 613-yard 5th. No. 5 is easily one of the best (and hardest) holes on the course. It rolls through a shallow valley with fescue-covered mounds on the left and a side channel of the Thornapple River on the right. Contrasting with most of the fairways, this one is narrow at the landing area, but at least there's a pretty view as you're dropping a ball to hit your second shot (okay, third--sheesh!). Another highlight is the 551-yard, par-5 13th. The river runs from tee to green on the left, so it's a very bad place to suddenly develop a pull hook (trust me). The fairway narrows into a tight neck up to the green, but a couple of good shots can leave you with a putt for birdie or a short chip for eagle. If not for the proximity of the freeway across the river, this hole would be downright idyllic. The collection of par 3s isn't particularly memorable, but there is a fine variety of looks off the tee, from blind ones (e.g., Nos. 1 & 2) to open ones (e.g., Nos. 10 & 11), to carries over wetlands (e.g., Nos. 7, 14, 17, and 18). The fairways and greens are generous enough, but if you happen to be hitting them crooked when you play here, you will burn through a good number of balls. Amenities are plentiful, with a three-tiered driving range, Clubhouse Grille and halfway house, well-stocked pro shop, and satellite yardage system on each cart (from which you can also order lunch). However, when we were there the satellite system was not operating reliably due to a lightning strike the week before. Worse yet, alternative yardage markers were somewhat hard to find. This constant source of irritation was compounded by the uncanny timing of the airplanes. Each time a yardage needed to be communicated from farther than ten yards away, a plane would roar overhead and drown out the message. Lots and lots of poor club choices make for a long day. The overall layout of the course is appealing--tough but fair--although a little confusing. Be sure to follow the signs (which could stand to be larger). 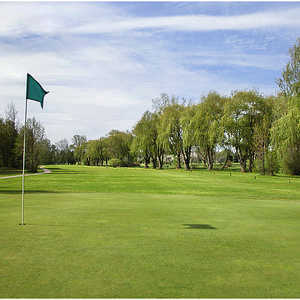 The greens are firm yet receptive, however several were quite seriously scarred with poorly repaired ball marks. Lush bent grass runs from tee to green, and the bunkering is understated (read: even a lousy golf writer can stay out of most of them). Although the course has already racked up some impressive events--for example the 1997-8 qualifying rounds for the Senior Tour First of America Classic--the rates, which range from $40 before 11 a.m. on weekdays to $60 during peak times on weekends, seem a bit high. However, if you're one of those well-paid execs taking the afternoon off, you probably won't care how much you have to pay as long as you can get some golf in over a long lunch. Personally, I enjoyed communing with the spirit of the late John Candy, incarnated as his character from the movie "Planes, Trains, and Automobiles." Each time a jet shattered my concentration on the tee, or a train vibrated my ball off line, or a car horn honked, I heard John chuckling in that chesty, conspiratorial way of his, trying to make me feel better. And, just like Steve Martin's character in the film, I eventually did.